The Queen of Spades is a fine film in its own right but it also has an interesting back story, having not been seen in British cinemas since its original release in 1949, and now getting a rerelease supported by, among others, Martin Scorcese who has recorded a special introduction to the film. 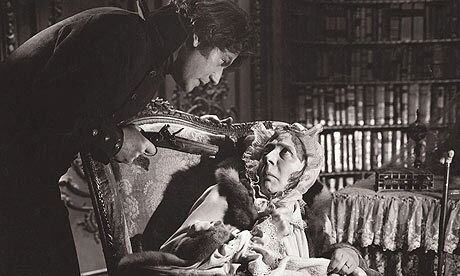 A Gothic thriller, it has much in common with Thorold Dickinson’s Gaslight (which spawned the Hollywood remake starring Ingrid Bergman). It’s beautifully lit and photographed, capturing the decadence of old St Petersburg before the Napoleonic Wars, and creates a wonderful atmosphere of tension in its depiction of a Faustian pact. There is some mystery about Captain Suvorin, yet initially the audience may even sympathise with his desperation to keep up with the Jones’, surrounded as he is by young men to whom money is nothing. But our sympathies are soon tested by his cold blooded pursuit of poor lonely Lizaveta, too naïve to see through his hollow words, and desperate for any kindness or sympathy. The Countess, once so beautiful and charming, is now a tyrannical old despot, keeping Lizaveta at her beck and call 24 hours a day. No one does imperious like Edith ‘A Handbag? !’ Evans and here she is marvellous as the bitter old woman who sold her soul for temporary salvation. Queen of Spades is the perfect antidote to the horrors of the sales, a splendid entertainment, and a bit of cinematic history all rolled into one.